1 Need to get a CCDO Card? 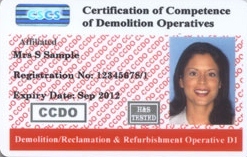 Demolition Constructio Cards What is a CCDO card? 2 How to get a CCDO card? 3 How long is a CCDO Card valid for? 4 How long will it take to receive my CCDO card? 5 What should I do if I lose my card? 6 How do I renew my card? 10 How Do I Obtain? 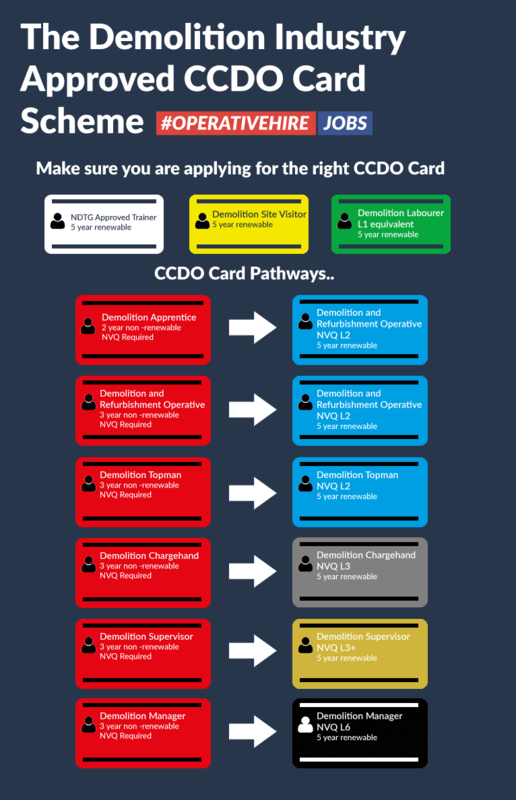 What is a CCDO card? 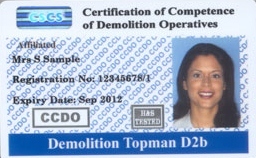 CCDO card was setup by the Construction Skills Certification Scheme to reduce the number of accidents in the demolition field. They are used for the demolition industry. CCDO are affiliated to CSCS, to ensure health and safety is present on-site. 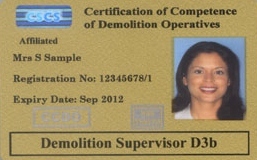 All employers in the industry require operatives working as a demolition operative have the appropriate CCDO card in order for them to work on-site. How to get a CCDO card? Step 1: Apply for the appropriate card. Please click here and select which card you need. Step 2: Take the CITB HS&E test. In order to obtain any CCDO card you must pass the CITB Health, Safety & Environment Test, click here to apply for CITB test. How long is a CCDO Card valid for? There are six types – (Red, Green, Black, Gold and two Blue) and the length of validity is dependent on which card you hold. How long will it take to receive my CCDO card? Once all paperwork (which includes your application form and proof of qualifications) has been submitted it and relevant fees paid it can take up to 30 days for your application to be processed and your card to arrive. You should be able to get a replacement fairly quickly. Make sure you contact the issuer as soon as possible. Renewing is the same process as applying for a new card. You will need to ensure all necessary qualifications and tests are up to date and complete a full application form. 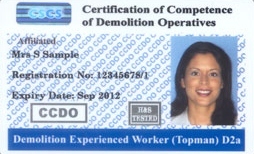 The CCDO Green CCDO card (labourer) is for demolition workers with very little or no on site demolition experience. The green card is required for labourers to gain access onsite to work and carry out basic duties. Obtaining the card shows that you have at least the minimum health and safety training and site skills work safely and effectively. Holders must work under close supervision by an experienced operative or manager. step 2 Has attended a Demolition Specific ConstructionSkills Health, Safety & Environment Test within the last two years. step 3 Has attended a recent Asbestos Awareness/Demolition Safety Awareness Course, please note you have to taken the course within a year with taken with UKATA or NDTG approved Training Provider. Step 4 Download the application from the NDTG training website. Workers can carry out general demolition duties working with experienced operatives. The operative would have demonstrated adequate knowledge of activities as per scheme guidelines in the CCDO Scheme Guidance Notes. 2 Current Demolition Specialist or above, Health, Safety and Environmental Touch Screen Test Pass. 5 Download the application from the NDTG training website. Cost per CCDO Assessment – Member: £200 + VAT (inc card fee) Non-Member: £270 + VAT (inc card fee). Aimed at: Operatives with a good depth of knowledge of the demolition industry. The experienced worker allows workers to carry out all duties as outlined in the Demolition, Reclamation & Refurbishment Card. Workers are expected to have a greater technical understanding of the Demolition Industry. Step 2:Has attended a Demolition ConstructionSkills Health, Safety & Environment Test. Step 3: Has attended a recent Asbestos Awareness/Demolition Safety Awareness Course, please note you have to taken the course within a year with taken with UKATA or NDTG approved Training Provider. Cost per CCDO Assessment – Members – £170 + VAT, Non-Members – £230+VAT, plus £30+VAT Card Fee is applicable to all assessments. Step 4: Has attended a Demolition ConstructionSkills Health, Safety & Environment Test. Cost for NVQ (QCF) Level 2. This card is for those who are in charge of a demolition site on a daily basis. Workers are expected to have a greater technical understanding of the Demolition Industry and should have an in depth knowledge of the GE700 and the BS6187-2011. Step 5: Candidate to attend the 5 Day Supervisor Course. <em?Step 6: Achieves required standard during Demolition Supervisor distance learning course and Achieves NVQ (QCF) Level 4- Construction Site Supervision (Demolition). Workers are actively involved in the management of a demolition project. The card is obtained through an intense training and assessment programme. The course consists of 5 interative training days. The final 2 sessions take place at the ACT-UK Simulation Centre in Coventry. Candidates will be industry assessed throughout the programme. Step 3: Has attended a ConstructionSkills Managerial & Professional (MAP) Health, Safety & Environement Test. Step 5: Demolition Experienced Worker (Manager) Card issued- please note, the Experienced Worker Card is a temporary card only. This card must be qualified through the QCF Diploma in Construction Site Management (Demolition) within the 3 year life of the card. Step 6: Register & Achieve QCF Diploma in Construction Site Management (Demolition) within 3 year life of temporary card. How long will it take to get my ccdo card? It can take up to 30 days once your have applied for your CCDO card and proof of qualifications. Hope this help James. Do you supply the ccdo card test and deal with renewals? Martin, we don’t we just offer information on how to get a CCDO card. You need to choose the card you require from the list above and then pass the CITB health and safety test. What would I require to to apply for a ccdo card I ask as cscs also have the option take specific parts of study for specific industries…ie a person does the general part first…then the chosen specific chapters. This all depends on what CCDO Card you want to apply for, if you could let us know we can advise you. Michael it all depends on what CCDO card you require to renew?